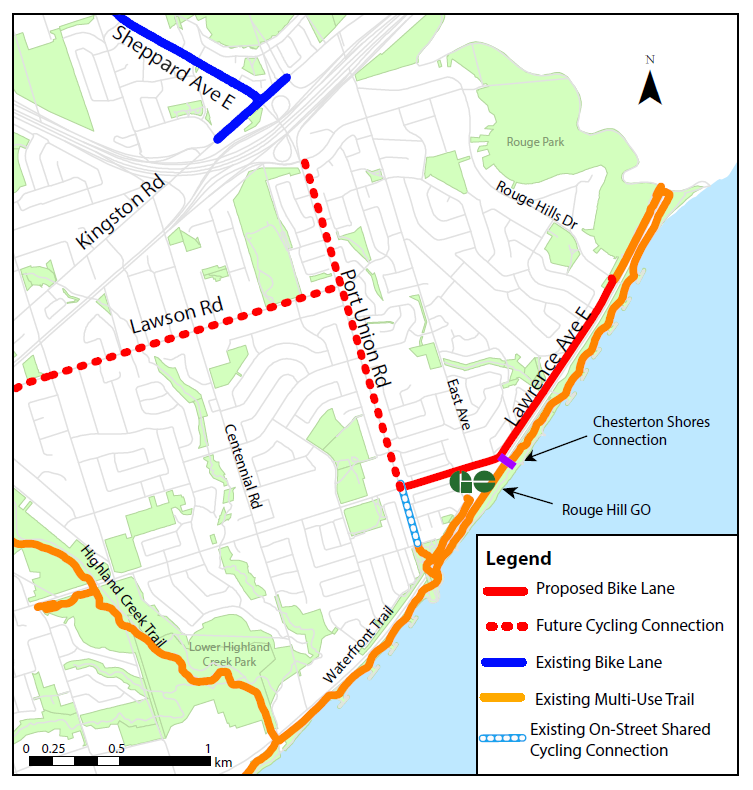 The City of Toronto is proposing to install eastbound and westbound bike lanes on Lawrence Avenue East between Port Union Road and Rouge Hills Drive. This section of Lawrence Avenue East is currently designated as a signed cycling route. This proposal would upgrade the signed cycling route to bike lanes to provide improved cycling connections between Rouge Urban National Park and the proposed bike lanes on Port Union Road, while improving safety for cyclists. The proposed bike lanes would also provide connections to the Rouge Hill GO Station and the Waterfront Trail. Please view the display panels from the public event and fill out the online feedback form. It will take approximately 5 to 10 minutes to complete the form. The last day to submit feedback is April 24, 2019. Attendees will have an opportunity to view and provide feedback on the draft designs for the proposed bike lanes and ask questions. The City of Toronto will be conducting major road resurfacing on Lawrence Avenue East, from Meadowvale Road to Port Union Road. This work is expected to be completed in June 2019 (depending on weather). Once this portion of the road is completed, the City will be conducting further road resurfacing on Lawrence Avenue East from Port Union Road to Frank Faubert Drive. The proposed bike lanes would be installed at the completion of this road resurfacing. Bike lane pavement markings would also be added on Lawrence Avenue East from Frank Faubert Drive to Rouge Hills Drive.